These fine-dining and polished-casual restaurants have become hotspots for craft beer. Above: At Bubba, you can enjoy Surly Brewing Co.’s West-Coast-style IPA “Todd the Axeman,” named for their guitar-playing brewer, Todd Haug. When it comes to the ever-growing craft-beer movement, I’ve come very late to the party. But these days, I’m all in. What took me so long? A variety of reasons, but the main one was this: As local beer kingpin Jeff Bruning, partner in the Full Court Press spate of casual, beer-centric restaurants, has so aptly put it, “Reasonable people eat when they drink.” While I’m not always reasonable, I do try to be: Whenever I have a drink, I want food close at hand. No matter how good the beer, foodless taprooms spell trouble for this lightweight. Of course, there’s no shortage of places where you can enjoy craft beer with burgers, pizza and hearty brewpub food. I’ve raised a glass or two of good beer with such food, and had a fine old time doing so. Bruning’s venues serve immensely satisfying casual food, such as the robust German specialties at Hessen Haus and the warming pub fare at the Royal Mile. Still, sometimes I’ve longed for more. After all, when drinking beer that’s painstakingly handcrafted, is it too much to ask for something equally artisanal—perhaps even subtle, seasonal and chef-driven—to go along with it? Happily, craft beer has recently made solid inroads into our city’s polished-casual and fine-dining realm. For sure, you’ll still find me enjoying a glass of beer at any number of casual joints for a relaxed, any-night meal. But on those nights when I crave something with more flair, I’m heading to one of these four food-forward spots that also happen to be hotspots for beer as well. 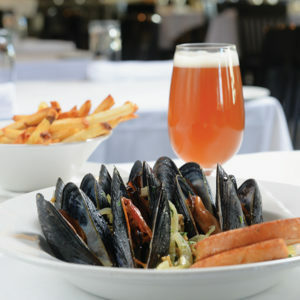 Centro’s Derek Eidson recommends Surette beer with the restaurant’s mussels and hand-cut fries. From Crooked Stave Brewery, Surette is a barrel-aged beer with a dry, tart finish, Eidson says. When asked how the craft beer movement was taking hold in his realm, George Formaro, executive chef and partner of the slew of restaurants under the Orchestrate Management umbrella, nudged me in the direction of Centro chef Derek Eidson. “Derek is geeky about beer the way I am about bread,” Formaro says. As any food lover in this town knows, that’s about as geeky as you can get. Centro now has eight draft lines, seven of which are focused on craft beer (the eighth is for Peroni, an ever-popular mass-produced pizza-perfect Italian beer). The seven craft beers on tap continually rotate, stretching across a range of styles. Yet whether they’re dark, sour, hoppy or light, each is rigorously chosen and knowledgably served. “We don’t have any thoughtless beers on tap. They’re all there for a reason—they’re limited, they’re special, they taste great,” says Eidson, adding that he fights for beers with limited availability. Being an insider among the local beer cognoscenti helps. “Since I’m into beer, and hang out with a discerning beer crowd, I have relationships with breweries and distributors,” he says. Hence, he’s able to snag rare selections that are usually found only in dedicated beer-focused bars such as El Bait Shop (a local venue reknowned for having one of the best beer selections in the country). Centro might be the only restaurant in town where you can drink a beer that the chef had a hand in brewing. Eidson recently collaborated with local brewery Barntown Brewing to come up with a proprietary beer called “Like Minded.” They brewed 20 barrels, which sold out quickly. Eidson plans to collaborate with Barntown on more projects in the future. Nevertheless dsm coaxed one steadfast pairing out of him. Each year on his birthday, he invites a houseful of friends to his home for moules-frites and his all-time favorite beer, gueuze, a barrel-aged Belgian brew. For this story, he suggested something quite similar: Centro’s mussels and hand-cut fries, served with Crooked Stave Brewery’s “Surette.” Eidson describes Surette as a barrel-aged beer with a dry, tart finish, deep oak character and hints of citrus. “Both the beer and the mussels have distinct flavors, but neither of them overpower one another, and the beer acts as a cleanser for the richness of the mussels,” he says. Cheese Bar’s raclette—crisp potatoes, bacon and sour gherkins—is thoughtfully paired with a Boon Framboise. Debuting last year, Cheese Bar is known for sourcing some of the world’s best artisanal cheeses and charcuterie, as well as using these goods to craft marvelous sandwiches, cheese-and-charcuterie boards, salads, fondue and raclette. With 30 beers on tap, they’re also known for their dedication to craft beer. Better yet, every single one of their beers on tap was chosen with food in mind. Unlike many venues that serve beer in only one size—often that ubiquitous shaker-style pint glass—Grooms, Bienert and team offer a choice of 6-ounce or 12-ounce portions of all draft beers. This makes it easy to enjoy a different beer at each stage of your evening. And with many options priced at $3 or $4 for the 6-ounce pour, you needn’t overspend to try a variety of beer. Wine habitués who are new to enjoying beer the Cheese Bar way would do well to take Groom’s recommendations on how to proceed through an evening. For an aperitif, he suggests a Belgian gueuze. “Gueuze is nice and acidic,” he says, adding that it has affinities to Champagne. For dsm, Grooms and Bienert paired their raclette—a traditional alpine dish of crisp potatoes, bacon and sour gherkins—with the Boon Framboise. As another option, they offered the Boon two-year lambic, a spontaneously fermented barrel-aged sour beer. Beer with dessert? Stay with us here: Tag Grandgeorge pairs his apricot upside-down cake with local brewery Confluence’s saison beer, an effervescent, fruity brew. Tag Grandgeorge, chef-owner of French-focused Le Jardin restaurant, was among the first local chefs to match craft beer with refined food. 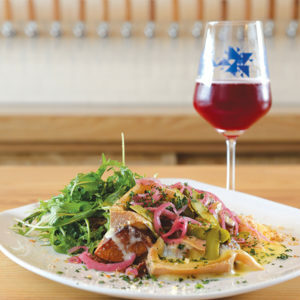 His first of numerous beer-food pairing dinners, in collaboration with Knoxville-based Peace Tree Brewing Co., debuted in 2011. Over the years, Grandgeorge presented Peace Tree beer dinners at different times of the year to highlight the seasonality in both the food and the beer. More recently, he’s been working with Confluence Brewing on similar beer-food evenings. At press time, he was teaming up with the Des Moines-based brewery to brainstorm a dinner that would focus on sour brews. He also offers a dedicated list of around 10 American regional craft beers on his menu every night the restaurant is open. Grandgeorge believes his cooking style pairs particularly well with beer. “As a chef I tend to cook flavor-forward foods,” he says, adding that food with strong and assertive tastes, including the slow-cooked or braised meats that often make their way onto his menu, go well with beer. That includes dessert. 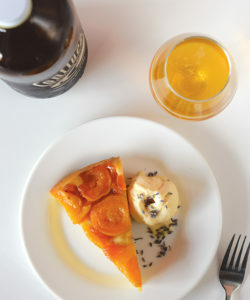 For a case in point, Grandgeorge pairs Confluence’s saison beer with his apricot upside-down cake. He describes saison as an effervescent, dry and fruity beer that can yield a number of spice notes; these include ginger, anise and bitter orange, all of which come from the use of French saison yeast. “The cake’s apricots and lemon syrup, along with the lavender herbaceousness of the ice cream, … has a way of pulling out flavors from the beer that only that pairing combination could accomplish,” Grandgeorge says. Surly Brewing Co.’s “Todd the Axeman” has citrus notes that pair well with the shellfish in Bubba’s shrimp and grits dish. Meanwhile, the beer’s effervescence helps to balance the creamy grits and blackening spices. With a sharp focus on all things bourbon, this stylish Dixie-inspired restaurant sells twice as many cocktails as beer and wine combined. Nevertheless, beer is emerging as an attraction here, and the beverage even outsells wine. Bubba offers 10 craft brews on tap and nearly 20 beers by the bottle or can. Such abundance was customer-driven. Conveniently, Bubba’s food pairs extremely well with beer. Sheldahl explains that Southern cuisine can be hearty and rich, and beer provides a great palate-cleansing quality that works well with this style of food. The restaurant’s top seller, in fact, is fried chicken. “I can think of no better beverage for that than a cold beer,” Sheldahl says. According to Sheldahl, another go-to choice with food is 515 Brewing Co.’s “OJ IPA,” an American pale wheat beer with a tangy yet mellow citrus flavor. He recommends enjoying it with fried appetizers or the restaurant’s salmon citrus-kale salad. 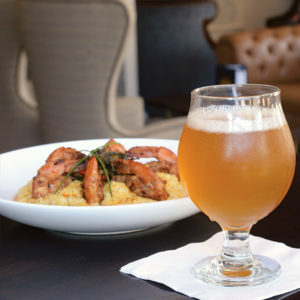 For dsm, Sheldahl paired Bubba’s shrimp and grits with Surly Brewing Co.’s “Todd the Axeman.” He explains that the beer’s two different hop varietals—Mosaic and Citra—bring citrus notes that pair beautifully with the shellfish. In addition, the beer’s effervescence and brightness help to balance the creamy grits and blackening spices. Canelés In Des Moines? Mais Oui!